Long before we had satellites and super-computers to process weather data, we had to trust our senses. And we came up with a series of weather sayings to aid us. The most famous of these is undoubtedly ‘Red sky at night, shepherd’s delight; red sky in the morning, shepherd’s warning’. But I don’t think I ever came across one to describe what I saw this morning. With ex-hurricane Ophelia barrelling towards the island of Ireland, everyone here is on high alert. The schools are closed. The universities are closing. The island is hunkering down in anticipation of what’s coming. But, this morning when I woke, the sky had a strange orange hue. There was plenty of cloud, but everywhere had a colour cast, the kind of colour you can get when a particularly strong sunset is happening above the clouds, strong enough to shine through. But, weirdly, as the morning progressed, this hue didn’t disappear. Long after the golden rays of sunrise should have dissipated, still it endured. Then the sun broke through a gap in the cloud. 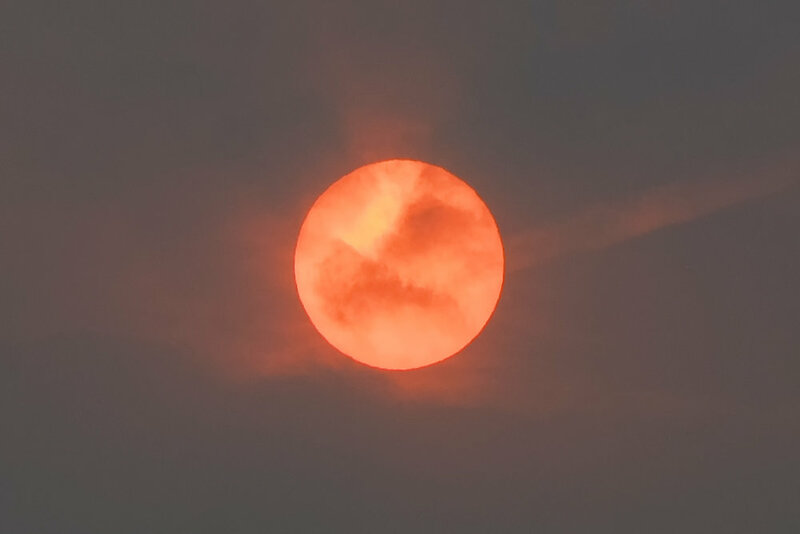 And at 10.00 am, a good two hours after sunrise, there was the orb hanging in our sky, glowing a burnt orange colour. There are only two things that can make the sun red - first, when it’s low in the sky at sunrise and sunset, and the light passes through more of our atmosphere, scattering all but the red wavelengths. And secondly, when there is a lot of dust in the atmosphere, also scattering the light. It was too late in the morning for the former, so it could only have been the latter. And a quick bit of research revealed that was indeed the case. 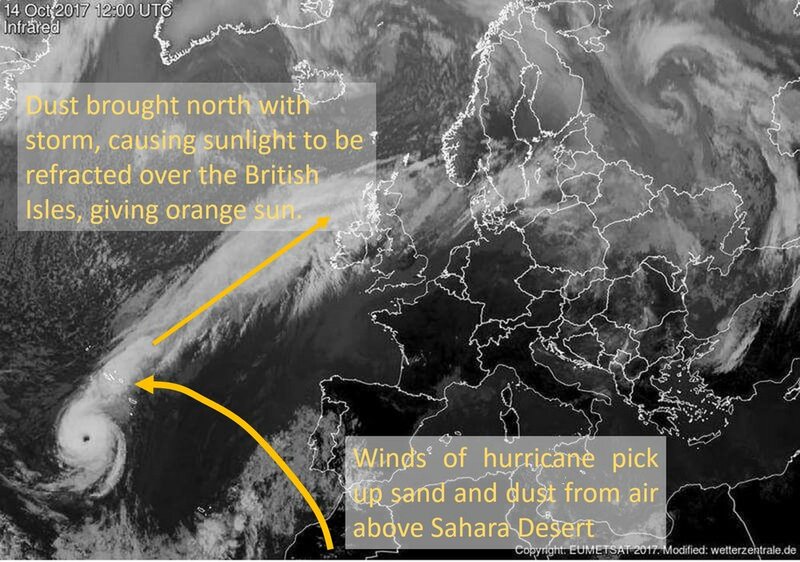 This record-breaking and very unusual hurricane had swept up dust from the air above the Sahara desert when it was off the coast of Africa near the Azores, and had swept this dust north with it. SOURCE: @wx_radar The dust concentrations in our atmosphere. You can clearly see the plume of dust that has been dragged up by the hurricane. As the sunlight passes through the dust, the longer wavelengths are scattered by the the particles. This scatters the blues and greens, letting the oranges and reds through. This happens at sunset as the low angle of the sun means the light travels through a greater distance of the atmosphere, and more and more of the blues and greens are scattered, leaving only the oranges and reds. But this morning’s dust meant that this effect could be seen, even after the sun had risen much higher in the sky than normal. Cool science - and a totally eerie and creepy effect, with the former hurricane headed our way! So, red sky in the morning, shepherd’s warning. 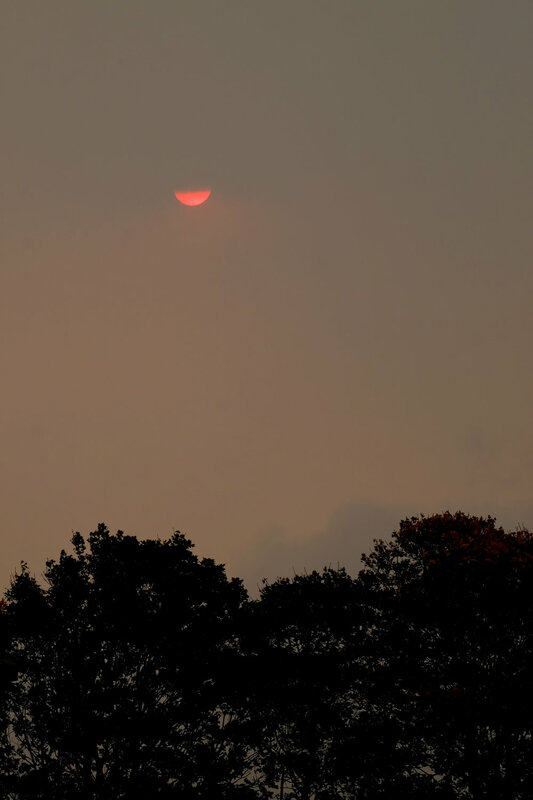 How about red sky during the day, hurricane’s on the way…?! ?